The M4 model case is designed for the M4 style weapon characterized by the adjustable stock and short foregrip appearance. This case will accept upper assemblies up to 25.5" from the tip of the flash hider to the base of the upper receiver or charging handle. There is clearance for all traditional optics. 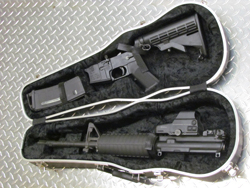 The case is designed for collapsible stocks only.